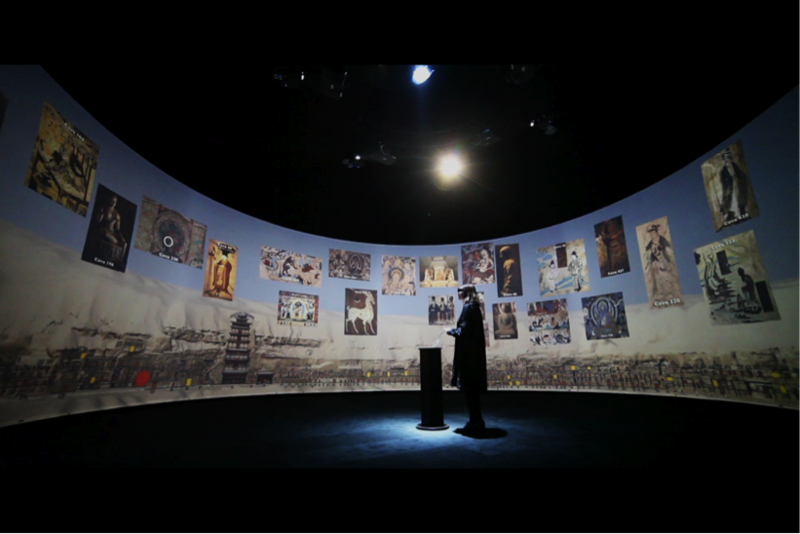 Image Credit: Pure Land: Inside the Mogao Grottoes at Dunhuang, directed by Sarah Kenderdine and Jeffrey Shaw, © Applied Laboratory for Interactive Visualization and Embodiment (ALiVE), CityU, Hong Kong, 2012. This presentation examines two exhibition installations that integrate high-resolution digital archaeological datasets (photography and 3D architectural models) with immersive, and interactive display systems. Exhibition technologies and content development strategies that support sensorial and experiential enquiry by visitors in the gallery are used here to release the latent potential of imaging data from heritage sites. The installations Pure Land: Inside the Mogao Grottoes at Dunhuang and Pure Land: Augmented Reality Edition allow visitors to interact with an augmented digital facsimile of Cave 220 at one-to-one scale. The multi-layered enhancements made to the underlying digital facsimile of the Cave can be interactively explored, analyzed and understood as an embodied 3D visual experience that brings new life to the aesthetic, narrative and spiritual drama of these mural paintings and sculptures. Described by Julian Raby, Director of the Arthur M. Sackler Gallery and Freer Gallery of Art, as “the exhibition experience of the future” these installations transform the passive spectacle of big screens into a kinesthetic, and performative experience of the places they depict. Imaging data at world heritage sites is fundamental to archaeological, conservation and preservation processes. And although this high-resolution data is accumulating daily in the archives of practitioners little of it finds its way into the public domain. Large-scale display systems offer the opportunity for this data to be experienced at one-to-one-scale in the form of augmented digital facsimiles. Such an approach has a significant impact on visitors’ cognition and also provides a powerful alternative for giving access to heritage sites under threat from tourism, conflict and climate change. At the same time the visitors to museums are increasingly interested in intuitively exploring and re-using the large digital datasets created through heritage documentation. This desire for creative engagement poses significant experimental and theoretical challenges for the cultural heritage sectors. Beyond Facsimile: Inhabiting the Caves engages cultural heritage data in future interpretation practices. Dr. Sarah KENDERDINE researches at the forefront of interactive and immersive experiences for museums and galleries. In widely exhibited installation works, she has amalgamated cultural heritage with new media art practice, especially in the realms of interactive cinema, augmented reality and embodied narrative. Dr. Kenderdine holds the position of Special Projects, Museum Victoria, Australia (2003–) and is Visiting Assoc. Prof., Director of Centre for Innovation in Galleries, Libraries, Archives and Museums (iGLAM) and Director of Research at the Applied Laboratory for Interactive Visualization and Embodiment (ALiVE), Co-Director of the LUXLAB, City University, Hong Kong (together with Kyoto University) since 2010. Recent books include the co-edited, co-authored Theorizing Digital Cultural Heritage: a critical discourse, Cambridge: MIT Press, 2007 (third reprint 2010) and PLACE-Hampi: Inhabiting the Panoramic Imaginary of Vijayanagara, Heidelberg: Kehrer Verlag, 2012. In preparation Kenderdine, S. & Cameron, F., Theorizing digital cultural heritage for a complex, turbulent and entangled world, Cambridge, MA: MIT Press.